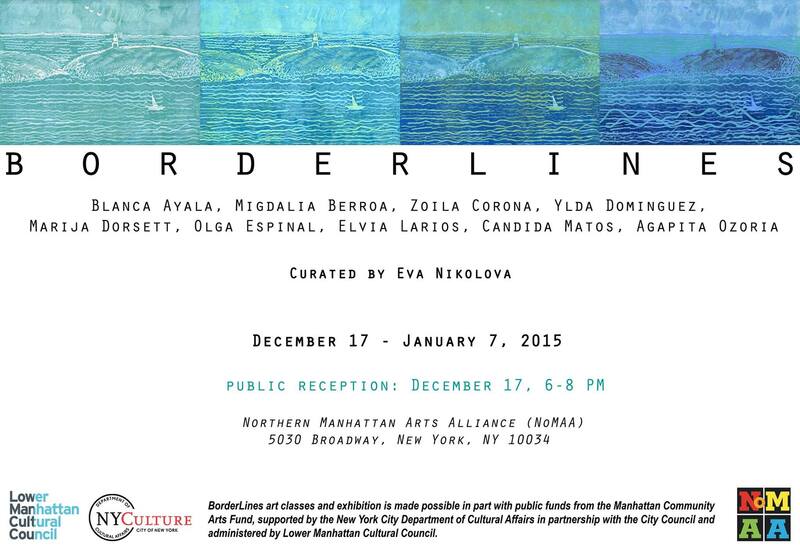 Opening reception: Thursday 17 December 2015, 6–8 p.m.
“BorderLines” presents drawings, paintings, collages and prints by nine senior women artists from Washington Heights created recently at the neighborhood’s Riverstone Senior Center. The participants share a common identity that coalesces around age, gender and the experience of cultural dislocation, yet it is the latter that often becomes the impetus for the work, as the artists—all immigrants—look back to a time and place from which they have been separated for many decades. 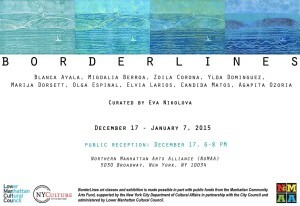 None of the nine artists in “Borderlines” have had formal art training; in fact, most began exploring art for the first time only recently, under the guidance of artist and curator Eva Nikolova, discovering a passion for narrating their stories, memories, fantasies and yearnings through the language of art. “Borderlines” celebrates their diverse sensibilities and invites the community to share in their discoveries. Participating artists: Blanca Ayala, Migdalia Berroa, Zoila Corona, Ylda dominguez, Marija Dorsett. Olga Espinal, Elvia Larios, Candida Matos, Agapita Ozoria. NoMAA programs are made possible thanks to the support of: AG Foundation; Broadway Housing Communities; ConEdison; Columbia University Medical Center; Dr. Elizabeth Sackler; Harlem Community Development Corporation; Hispanic Federation; Manhattan Times; National Endowment for the Arts; New York Presbyterian Hospital; Office of Council Member Mark Levine; Office of Council Member Ydanis Rodriguez, Council District 10; CUNY in the Heights; Harlem Arts Alliance; Hispanic Society of America; Isabella Geriatric Center; The Malcolm X & Dr. Betty Shabazz Memorial and Educational Center; Manhattan Community Board 12; Manhattan Community Board 9; Manhattan Times; New York City Department of Parks & Recreation; New York Restoration Project; Rio Gallery; Sugar Hill Children’s Museum of Art & Storytelling; The Uptown Collective; Washington Heights & Inwood Online; Washington Heights BID; United Palace of Cultural Arts Inc.; West Harlem Community Development Corporation; Workspace Offices Studios.